What do we know so far about the Vernadsky Challenge? The Vernadsky Challenge has been a meeting point for all tech enthusiasts and startups for the past three years. Over 570 applications from 14 countries tried their hand in this awesome battle, but only 10 have become winners. The engineering startup competition provides its participants with reviews from industry expert, as well as customer feedback. The most promising startups also get grants from Noosphere Ventures of Max Polyakov for further development of their innovative ideas or products. The organizers are interested in a wide range of fields from space technology and robotics to military and medical equipment. It doesn’t matter if you have only an innovative idea or a finished prototype, you still can enter the contest. Its contribution to innovation and economic growth is hard to overestimate due to the fact that Vernadsky Challenge, along with its organizers, Association Noosphere and Max Polyakov, support everyone who has an innovative idea. Startups always look forward to the Vernadsky Challenge. For example, there were 230 entries in 2017. Furthermore, each year the competition extends its boundaries, as there are participants not only from Ukraine, but also from the USA, Israel, Armenia, Kazakhstan, Azerbaijan, Belarus, and India. And there are more to come. Who are the winners of Vernadsky Challenge 2017 and how did they hit the top of CES 2018? It is important to remember that only 10 startups can reach the final show, hosted in Dnipro by Association Noosphere along with its co-founder Max Polyakov , and pitch their product ideas to the panel of judges. 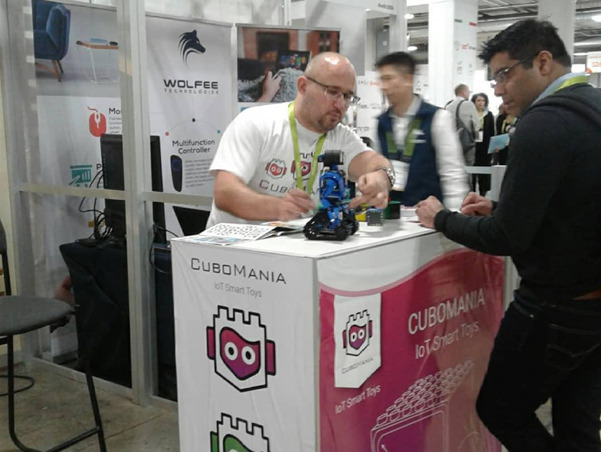 The best of them were the Mykolaiv startup Cubomania, Cardiomo from Kyiv, and CloviTek, based in the USA. They took 1st, 2nd and the 3rd prizes respectively. Let’s have a closer look at each of them. The first one is Cubomania. The Mykolaiv based startup presented the idea of interactive cubes and toys, which help children to develop their mobility, logic, financial literacy, and math. In addition, these special cubes can teach the little ones how to consider other people. As the Vernadsky Challenge 2017 winner the Cubomania Team received the 30,000 USD grant from Noosphere Ventures, managed by Max Polyakov. Now this team is supporting their good work by improving their product and participating in startup battles like IT Arena, Innovation Market, UVCA Challenge CES-Edition 2018. They are oriented on the USA and big Europe markets, such as ones in German, Italy, Spain, Poland, and Turkey, where the average customer spends around 255$ - 500$ on toys. The second one is Cardiomo. This team is quite experienced compared to Cubomania. They are based in Kyiv and have 3 years of practice pitching their ideas and attending different startup contests. At Vernadsky Challenge 2017 the innovative health monitoring device was awarded a 22,500 USD grant from Noosphere Ventures and Max Polyakov. The Cardiomo Team performed well, not only in Ukraine, but also at the biggest startup shows arranged in the USA. For example, at CES 2018 they presented a new version of the device Cardiomo Series 2 and won the pitch competition from Techstars. Cardiomo co-founder, Roman Belkin, believes that such competitions as the Vernadsky Challenge and CES help startups to examine their ideas or products. They are places that every startup in the world must visit. And the third one is CloviTek. This ambitious startup was founded by Vitaly Kirkpatrick from Chernovtsy. Now this young man lives in Salt Lake City, Utah. So his company is also based there. The CloviTek Team invented the world smartest wireless audio transmitter for any kind of audio source. This device allows people to watch TV without disturbing the people around them. They can listen their favourite shows through their phones or tablets. At Vernadsky Challenge 2017, Vitaly won a 15,000 USD grant from Noosphere Ventures of Max Polyakov. Furthermore, at CES 2018, CloviTek Team was recognized as an Innovation Award Honoree. As was can be seen from the above, the Vernadsky Challenge supports young and talented minds in a wide range of fields, and provides them with the chance to shine at the best world tech shows. By the way, the VC grants covered transport costs for Cardiomo and Cubomania. So, the Winners of Vernadsky Challenge 2017 had the opportunity to make a big splash at CES-2018 by showcasing their innovative products. Trump Administration To Privatise The International Space Station By 2025? The hotel boasts 75 floors and measures 356 metres in height, 232 Deluxe Rooms, 265 one-bedroom and 31 two-bedroom suites. The Gevora will be equipped with a pool, Jacuzzi, health club and luxury spa according to the Khaleej Times . Ahead of the funeral Cork City manager John Caulfield encouraged the people of Cork to turn out in force as a show of support. He said that the late Corkman "completed his life to the full" and was a loving, caring husband and father-of-three. He shares daughter Isan (16) with Norgaard and another son Winston (three) with former girlfriend Naiyana Garth . She said "yes" and they shared a smooch as the audience cheered on the couple. Ajay Devgn plays an IT officer in the film and his long work hours naturally keep him away from the family. Raid will be the second collaboration of Ileana D'Cruz with Devgn after 2017's Baadshaho . The all-India general CPI inflation eased to 5.07% in January 2018 (new base 2012=100), compared with 5.21% in December 2017. Food prices have softened, reflecting eased vegetable costs following stepped-up arrivals in markets of fresh crops. Baird reiterated a "buy" rating and issued a $212.00 price objective on shares of Raytheon in a report on Tuesday, October 24th. This buyback authorization authorizes the aerospace company to buy shares of its stock through open market purchases. She said that the terrorists who attacked Jammu Army camp "enjoyed some local support, had handlers across the border". The police said terrorists of Jaish-e Mohammad were involved, who were killed after a almost 36-hour operation. Investors look at the Volatility 12m to determine if a company has a low volatility percentage or not over the course of a year. The company reported $0.42 earnings per share (EPS) for the quarter, topping the Zacks' consensus estimate of $0.38 by $0.04. He called for global support for the inter-Korean rapport in a bid to maintain the tension-easing momentum on the peninsula. President Donald Trump and with Jared Kushner, Trump's son-in-law who is a close advisor to the President.